In the late 1980s Canterbury City Council began a process of opening up the riverside corridor in the city to people. Today, access paths for walking and cycling follow the twists and turns of the river as it flows through the various parks and gardens of the city. As a consequence, the riverside routes are now very popular and well used by everyone. The river itself is currently home to three punt and boat companies with a canoe company also looking for an operational base. Given this situation the river in the centre of Canterbury is not best-suited to fishing. This advice note will expand on the reasons for this and will provide alternative locations. The city is a popular place for people – residents and visitors. The riverside access routes which pass close to the riverbank are particularly attractive to walkers, cyclists and joggers. 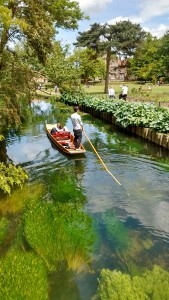 The river itself is licenced for punts, rowing boats and canoes. There is a health and safety risk from casting lines with hooks across pathways. There is a complex arrangement prevailing whereby byelaws outlaw fishing in certain city council-owned parks and gardens. In other areas the riverside is in private ownership and the permission of the owner is required before fishing. The deeper pools close to mill races are characterised by high enclosing walls. Fish caught in these situations are difficult to land without causing distress and injury to the fish. Paths adjacent to these locations are often narrow and very popular with people. Fishing is not appropriate in this situation. The winding, narrow river corridor in most of the city is characterised by the presence of obstructions in the form of bankside trees, shrubs and overhead power lines. Empirical evidence suggests anglers are more likely to snag fishing lines in this context compared to more open countryside. Discarded fishing line and hooks represent a hazard to wildlife, particularly waterfowl, bats and other terrestrial mammals. Regular fishing from the same position may result in food and bait being discarded on the bank. This is not only untidy in appearance but is known to attract vermin. In an urban context this can quickly escalate into a serious issue. Fluctuating water levels, coupled with the obstruction of weirs, mean fish in the urban reaches of the river are often under stress. Fishing in such circumstances can exacerbate the situation. Fish in the Stour are under pressure from many factors. We would like to promote the city centre as a safe refuge for fish; a place from which they can spread out to improve the overall sustainability of the fish population throughout the river. The river margins in the city are increasingly coming under pressure from invasive plant species such as Japanese Knotweed (Fallopia japonica) and Himilayan Balsam (Impatiens glandulifera). Anglers who disturb marginal vegetation may inadvertently contribute to the spread of these potentially harmful species. To conclude, the River Stour running through the centre of the city is not managed as a fishery and the river is not best-suited to the activity of fishing. Those wishing to fish the River Stour are encouraged to join the Canterbury and District Angling Association. The Association provides nine miles of fishing from Fordwich to Plucks Gutter on both banks, with car parking at several points. There are also numerous commercial fisheries within easy reach of the city. Those with a passion for angling, or just pursue fishing as a casual pastime, are encouraged to seek out alternative venues to those in the city (see below).